Fuel Efficient 4-Door with Room for Car Seats. I would like a car that is incredibly reliable, fun-to-drive, and isn't a Toyota Prius. I would love an electric car, if possible, to save on gas. I need it to be able to fit car seats in the back if needed; at least two car seats. 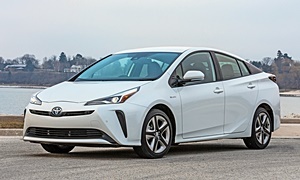 I have looked at the Toyota Prius, the Toyota Camry Hybrid, and the Nissan Leaf. The Prius sounds like it is going to fall apart when I drive it, and it isn't a comfortable ride. The Camry Hybrid was excellent, but it is on the more expensive side. The Nissan Leaf was great, but I'm worried about the range. I have driven the previous generation LEAF and I didn't really like it. It didn't handle well (very squishy ride creates a lot of body roll), the interior was cheap, and overall it wasn't a car I would consider. A couple of my co-workers had 2016 LEAFs and they both sold theirs because neither could hold a charge for over 60 miles. I haven't looked into this issue, so I don't know if it is a widespread problem. The new 2nd gen LEAF looks to be much better, though the Chevy Bolt and Model 3 are better. I have a 2005 and 2016 Prius and disagree that they feel tinny and cheap compared to what it competes with, but to each their own. The 2nd gen was nice at the time, but the 2016 and newer ones feel much better than the older ones. You probably drove a 3rd gen 2010-2015 so I could see why you said that. They hold up extremely well. My 2005 has 258k miles and it has had only a couple A/C problems. 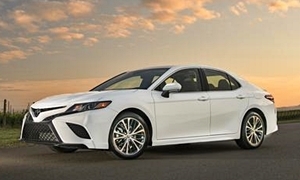 The Camry Hybrid is about as reliable as the Prius. I'll be a little bit nicer and more substantial since it is a bigger car, but that will sacrifice some gas mileage. For the Camry Hybrid, I'd get a 2012 or newer one for the newer design and features, but they have always been reliable. The Camry has a larger backseat, but both are able to fit two car seats just fine. Consider the Kia Soul EV. The rear seat is spacious, it drives pretty well, and it has a lot of features. Also VW has the Golf EV, which is fun to drive but smaller. You could also consider the Chevy Volt, which gives you some EV range without the range anxiety. It makes it a lot easier to live with. The Volt has a very small backseat that only seats 2 uncomfortably, so I'm not sure if a car seat would fit. Reliability hasn't been as good as the Toyotas either. My friend has a 2014 Volt and he likes it but has had a few problems with it. I drove it and can confirm that it is sportier than the Prius, but is more cramped and less comfortable. EVs tend to depreciate more than gas cars or hybrids, but that might be because their batteries aren't what they used to be. You don't mention what is an acceptable range, so it is hard to say what you are looking for. You said the Leaf's range is not enough (pure EV) and then compare it to two hybrids you looked at. Is 300 miles enough range? If 300 miles is what you are looking at, there are a few choices right now but more coming soon from Jaguar, Audi, and a few others brands. 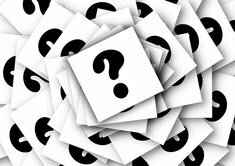 Reliablity is unknown since they are just coming out, and they are sure to be quite expensive. Lectrofuel gives a good overview of the already available Bolt and Tesla 3. Note the Bolt can be had for about $35,000 but the Tesla Model 3 starting at $35,000 is only being sold fully loaded as Tesla is trying to make money now. So expect prices north of $60,000 plus a waiting list for that car. If fully electric is what you want and need, probably the only viable option at this time if you want it right away is the Bolt. Is it as reliable as Toyota? Probably not. However, reports are for the first year that it is a pretty reliable car. Hybrids are more available and more competition. My neighbor has the 2017 Chevy Volt but only 15,000 miles so that is not a good basis for reliablity. His car is fine but reports are out the car does have some teething issues on launch (fortunately, he has not experienced them). He has two small kids, one is 11 and fits in the back, the other is 5 in a car seat and fits just fine. So I guess the back seat in the latest version is big enough (he takes the car on 500 mile trips to visit his mother, so they are partly electric with about 50 to 60 miles range, and the rest is on the generator which gets about 40 mpg highway). Just test it to see if it fits your needs with the children's seat. 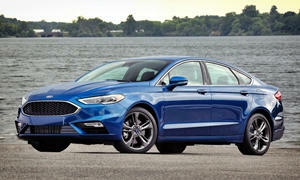 You could try the Ford Fusion hybrid. It uses a system similar to Toyota's (they pay them for some copywrites as some parts are very similar - but it is not the same system). It is probably a good option if you like how it drives and don't like Toyota. It is farily reliable and one of Ford's good products. It gets 43 mpg city/41 mpg highway (EPA) so it gets very good gas mileage. The Kia Soul EV is about the same reliablity as the Chevy (a little better). It is another option as Electrofuel states. You should check that out as well. The VW Golf EV has more reliablity issues than any of the cars listed. Redesigned in 2015 there are reports of electrical problems on the EV, and fuel system issues on the gas model. Probably the most sporty of this group, you have to want more performance if you want that car - it is not going to be as reliable as any of the above. You can get a Model 3 for $49k for a RWD with the Premium upgrades, no Autopilot. The delivery time for this configuration is down to 4 weeks now, which is actually shorter than the Model S and Model X. Considering it costs four times the OP's budget before incentives, I don't think it is worth mentioning. Also remember that EVs require less maintenance and usually have less reliability problems than a gas/hybrid car. You have to select the $49k RWD Long Range and then it will say "Delivery within 4 weeks" at the bottom. It is based on location also, so that time might differ for some people. The $64-70k Model 3 Performance AWD is delivery within two months. The cheapest $35k Standard battery says it will be available in 4-7 months. Thank you Lectrofuel. When I click on that link since I am on the east coast I get 9 weeks at best. So yes, it does depend on location (and it is harder for me to get that $49,000 option - if I go for the more expensive option it moves it up at that point down to November). So that cheaper price is not available everywhere at 4-5 weeks (first week of November at earliest). So it is becoming somewhat more available. 1) Investment rating has dropped to one level above junk bond status, which is not good. 2) Musk's tweet about taking it private is being investigated by the government and if they are found guilty of insider trading (not likely I admit), fines could come about. 4) Musk was offended when they cavern submersible submarine was declined to save the futbol (soccer) team trapped in the cave in the far east when floods came (first action people question before the actions listed in 2 and 3). Not saying Tesla is not safe as of yet - but it is not doing all that well financially. Time will tell if it can hold its own (and it is a little risk for Tesla buyers right now). The extra delivery time makes sense if you deliver the car to the east coast from California.I agree with the Tesla problems. Guys, you seem to have missed the "max $12,000." A Tesla Model 3 or Bolt EV isn't going to work. Some VW e-Golfs are priced almost that low, but range and reliability could be issues. A shame, as I really like how they drive. I agree with others that the Volt checks a lot of boxes, but that reliability is a concern. Repairs could be very expensive if they are needed. 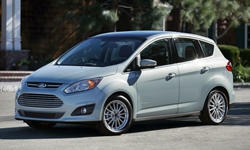 A Ford C-Max could be a very good fit, if the car seats fit. 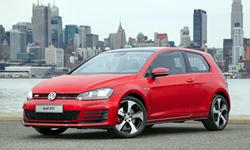 Designed primarily for the European market, they drive very well and get about 35 mpg in real-world driving. They feel much more solid than the Prius. As used cars they can be very affordable. Reliability is a moderate concern, but with the conventional hybrid (as opposed to the plug-in, also offered) the battery is pretty small and so shouldn't be terribly expensive to replace. I'd only consider the plug-in hybrid version if you'll only drive 10-20 miles on most days. I'd also consider a non-hybrid hatch that's simply fuel-efficient, such as the Mazda3. Though it's not a hybird, the Mazda3 is about as fuel-efficient as the C-Max. A Scion iM (rebadged as the Corolla iM after Scion was killed) could also meet your needs well. You might have missed my second post, but I said the Model 3 wasn't worth mentioning because it costs 4 times the OP'sbudget. If the Prius wasn't comfortable for you, the Mazda3 is bone rattling at least for the 2014-2016s. I'd imagine the older two generations would be even stiffer and louder but I haven't driven those. The backseat is also very small in terms of legroom. It is a great car otherwise. Really, the Prius will be one of the most comfortable cars mentioned so far for a soft ride. Don't get one if you need engaging handling or acceleration. The 2015 and older Prii had a marshmallow-like driving experience. Comfortable, but don't fall asleep driving it. Same with the LEAF.Since you like the Nissan LEAF, I assume you prefer a softer ride. I think I read the OP's criticism of the Prius differently, as meaning that the car felt insubstantial and cheap, but can see now that you probably read it correctly. Good point on the $12,000 but getting a reliable, fun to drive hybrid for $12,000 is going to be very difficult, if not impossible. It may not be fun to drive and seem tinny on the inside, but the Prius since it has been around the longest will give you the most selection - and will be fairly reliable. I found a 2012 Toyota Prius (I know, doesn't like) for $12,900 which is already over his amount. A 2007 goes for $7600 with about 100,000 miles which is 100 miles from me. Micheal's comment about the C-MAX is a possiblity since they pay Toyota a few roylaites as the cars powertrain is similar (not the same). There are a couple near me in his price range. A 2013 with 43,000 miles is going for $10,000. A 2013 with 100,000 miles is going for $9000. That is it within a 100 miles of home - so slim pickings. A Chevy Volt 2012 goes for $10,000 with 83,000. That is it within 100 miles of my home. That is it as the rest are north of his number (and it is not as reliable as the previous two). 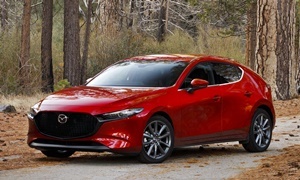 I agree with the others that your best bet is a Mazda 3 which is not a hybrid but is fun to drive and gets pretty good gas mileage with its four cylinder engine. It is pretty reliable as well. There are plenty of those near me in your price range and with low mileage and relatively new. For example, a 2015 for $10,500 with 39000 miles with an automatic and four doors. For that model, there are a lot to choose from and I think it your best bet.